At last! At long last! 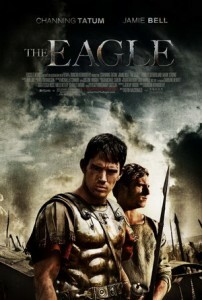 A movie set in Roman Britain that I really quite liked! 1) The book. The Eagle of the Ninth is a wonderful book by Rosemary Sutcliffe. It was one of my mother’s favorite books and she gave it to me to read in one of those old hardback editions with fraying edges. A story of a son trying to redeem his family’s honor after his father led the Ninth Legion to their doom in Scotland. Great stuff. The movie follows the book plot better than you might expect. 2) The beginning. It drew me in. I felt for this guy. I wanted to find out what happened next. Always good in story-telling if your readers can find their feet right off (see my review of Ironclad, where I didn’t: http://www.sarahwoodbury.com/?p=3371). 3) There was no fake romance in this movie. In fact, I think the only women in this entire movie are a few bedraggled Picts. But that was good because it was much better than having either screaming naked women fighting in battle (e.g. Keira Knightly) or blood-thirsty, all-knowing Pict women (e.g. Centurion). 4) I couldn’t predict what was going to happen. My husband had seen this movie, described it in vivid detail at midnight after staying up late to watch it, and I was still not sure how it was going to end. 5) The relationship between the two main characters, Marcus and Esca. Esca, in fact, was really great. Marcus’ performance has been described as ‘wooden’, and maybe he wasn’t terrific, but he was stoically Roman, which is what I suspect he was aiming for. He does strongly resemble a college quarterback. That’s not necessarily a bad thing 🙂 Donald Sutherland also has a wonderful performance as Marcus’ uncle. This is a less violent movie than Kingdom of Heaven and Ironclad. Hard to believe. Four stars. Next → Next post: What is the significance of ‘After Cilmeri’?